As the world becomes increasingly connected – forming a big global community, person identification has become imperative due to increasing risk concerns. Identity verification options, such as passwords and cards no longer suffice for diverse businesses. What is vital, is a robust and reliable identification system that ensures round-the-clock confidentiality and security of an organisation’s highly sensitive data. SecuRegister™ is Techno Brain’s multi-modal bio metric system which enables person identification, registration, and enrolment. It is a scalable and flexible product that efficiently manages data and associated functions. The product can be deployed over wide areas, such as – passport issuance, national ID, mobile banking, micro finance, driving license, jail management, etc. From mission-critical applications to small projects, SecuRegister™ is a proven platform that captures an individual’s bio metric features and links them with approved documentation. 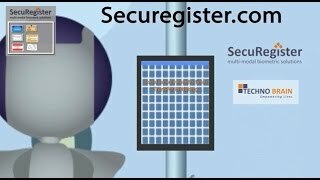 Techno Brain’s Identity Management Solution Platform – SecuRegister™ is a multi-modal, device and algorithm independent, bio metric software platform. From multi-modal bio metric capture/matching and credential issuance, SecuRegister™ provides a flexible, technology/vendor- independent “plug-in” approach thus, creating a layered, highly modular framework. Built on SOA architecture, SecuRegister™ combines performance and scalability to provide bio metric identification technology services – enrolment, identity vetting, identification and verification – with near limitless scaling of computational and storage capacity. SecuRegister™ achieves optimal performance whether delivered as part of traditional on premise client server computing solutions, or embedded in cloud-based services. Techno Brain implemented a bio metric-based Grower Registration System for capturing the information of tobacco growers for the Tobacco Control Commission. The system provided instant, accurate and consistent data results at all times. The Zambia Police wanted an automated fingerprint identification and verification system, to reduce the rate of errors during fingerprint matching. Techno Brain’s state-of-the-art solution helped the Zambia Police to easily handle their workload, and increased their capacity to search through huge volumes of fingerprint data with high accuracy.